Eggs. Love them or hate them; the choice is yours. They’re protein packed, but how do you cook with them? A good morning egg scramble is one way to start your day. You can slice them up and enjoy them on a salad. Egg salad sandwiches are delish, but can get boring after awhile. What about a deviled egg? They are so rich and creamy; a perfect additional side salad for lunch. 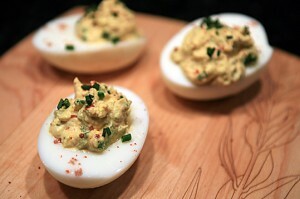 There are a millions ways to make a deviled egg, which is your favorite? Remove yolks from each egg and place them in a small bowl. Gently run each half under water, cleaning the egg. Place egg on paper towel, cut side down to drain. To the yolks, add in the remaining ingredients. Use a fork to incorporate. Use a small spoon to fill egg whites with yolk mixture. Refrigerate for 30 minutes. Garnish with chives paprika.